When it’s cold out, there is nothing like a warm bowl of soup for lunch. My kids have been going through soup like crazy. We’ve been making butternut squash soup, sunshine carrot soup, and french onion soup. We have lots of soups on rotation but of course my kids have their requests and when it works out, I do try to indulge them. One of their soup requests was Alphabet Chicken Soup. I think it’s mostly because they enjoy the fun pasta shapes in their bowls but that’s fine with me. 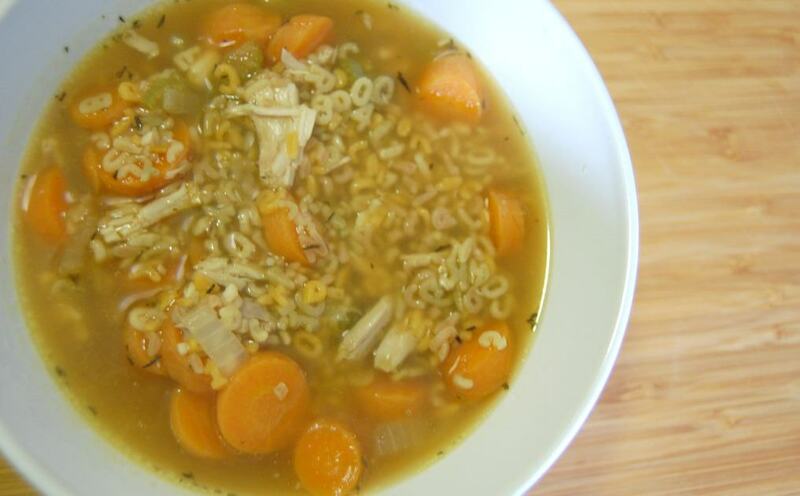 Chicken soup is wonderfully healthy and pasta shaped like ABC’s makes my kids even more eager to eat soup. Plus then usually end up spelling words or at least pointing out the letters so it’s educational as well! This recipe is very simple and it’s a great way for me to use up my leftover chicken from when I make my chicken in the crock pot. In a medium pot, add broth, vegetables, garlic, and seasonings. Cook for 5 minutes. Note about Noodles: You can of course use any type of noodles you would like. My kids however prefer Alphabet noodles. We use EdenFood’s Organic Pasta Vegetable Alphabets, which are colored by vegetables, which means the pasta is not only in fun shapes but fun colors. I love it…why open up a can? Tiny egg noodles in fun shapes are good, too and you have added some more protein to the soup.